Casinos, located in Tucson, Sahuarita and Why, Arizona, with plans to open a fourth facility near Glendale. 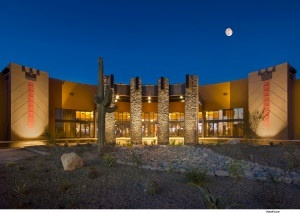 The Tucson property was the first casino and hotel facility in Southern Arizona. The Nation has been continually reinvesting in their properties with new gaming and hospitality amenities that help keep them competitive. Desert Diamond Casinos has also realized benefits by investing in improvements to the facilities’ physical security infrastructure that includes upgrading their Morse Watchmans KeyWatcher key control and management system to the new KeyWatcher Touch. The KeyWatcher system allows Desert Diamond Casinos to quickly and easily comply with a variety of State and tribal rules and regulations pertaining to control and management of facility keys. For example, all key activity transactions – including time, date and authorized user – must be recorded. The KeyWatcher system automatically records all transactions and provides a “notes” feature for users to indicate why unscheduled drops may have occurred. Usage reports required by the various agencies can be generated as needed or per the schedule. To meet gaming regulations that require the three man rule to access sensitive or restricted key sets, the Morse Watchmans system is programmable to recognize these keys or key sets and open the cabinet door and release them only once the three required logins are complete and the credentials verified. From a convenience standpoint, the KeyWatcher system is configured to use the same employee proximity ID badge that is used with the Casino’s access control system. The KeyWatcher cabinet will not open until the system verifies that the user has permission for the specific key or group requested. The time restriction feature helps management keep a tighter control on sensitive keys because it can be set to notify security when a key is overdue. 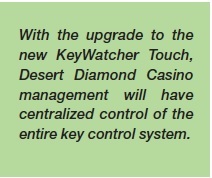 With the upgrade to the new KeyWatcher Touch, Desert Diamond Casino management will have centralized control of the entire key control system. Touch allows synchronization of the same information across all of the key control cabinets to simplify updating user key access or enrolling information. Profiles can be created and assigned to each user and any changes to the profile are cascaded down to the users assigned to it. The move to a common user database helps ensure system integrity and even allows for auditing transactions and history after an employee’s departure. Because the upgraded system will be integrated with the casinos’ business / communication network, email and SMS texts can be sent automatically to authorized individuals. Locating keys or determining when a key is scheduled to be returned will also be faster and easier with the new features of KeyWatcher Touch. 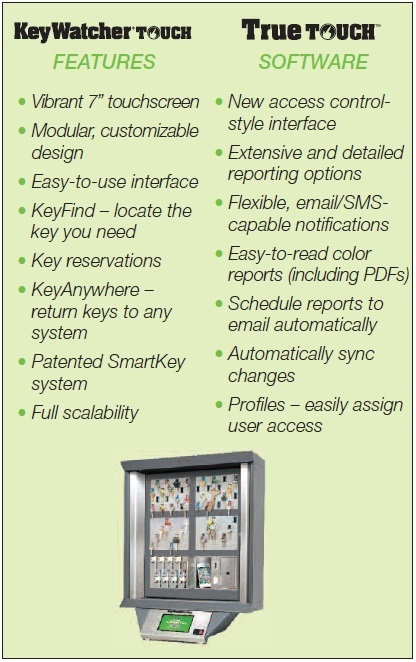 Other innovative features of KeyWatcher Touch that make it ideal for casino applications include the time-saving KeyAnywhere capability that allows the return of a key to any KeyWatcher Touch system within the enterprise, and the KeyFind feature that enables users to quickly locate which KeyWatcher Touch a specific key is in or determine who has it out.